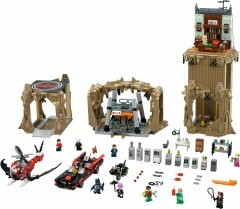 Batman Classic TV Series - Batcave set 76052 is currently on sale at shop.LEGO.com. There's a 25% discount taking the price down to US$199.99 / CA$244.99. Furthermore, you'll receive double VIP points and a free TLBM colectable minifgure with your order, too. If you don't already have set, now would be a good time to buy it: I suspect the offer is to shift remaining inventory before it is 'retired', so don't wait around too long. Please use these links to place your order: USA | Canada. Thank you. Showing as 'Retiring soon' on UK Lego store. Never understood why this set was popular or better received than the UCS Assault on Hoth. The bat caves are rubbish with a manky shade of brown, minifigures are nothing special, the batmobile and batcopter are okay. It kind of makes it tempting and yet I hesitate as there are only parts of this that appeal to me and even though its discounted I still think the price is beyond what I would pay for something I don't really desire. Such a dilemma! @gunther.schnitzel The hoth was worse as it was also mostly rehashes whereas this was all new. I actually like the set. I agree with the criticism that it isn't a nicely rounded design as a whole, but the minifigs are very true to their actor counterparts (including Cesar Romero's moustache), the vehicles and lab equiptment/computers are great and there are some nice parts to be had (wallpaper!). The Assault on Hoth set was worse than this set in many ways. Getting classic Batman related material of any kind was greatly welcome...I mean, how many modern Batmobiles do I need in my collection? But I don't have an old style Batmobile, and this one is really fun. The unique wallpaper pieces, 60's tech panels and all the beakers and science-y stuff is also really nice to get. Could they have done a better job bringing it all together? Yes. I'm almost tempted to buy two more sets at that price to enclose Wayne Manor and provide a more complete "cave", and sell the extra minifigs, batmobile and batcopter. Dang, they had to sweeten the deal after I jumped on the previous 20% off offer. I guess they're really having trouble moving the remaining inventory - I'm surprised Adam West's death didn't cause more of a jump in demand. Anyway this is a good not great set with truly great minifigures. Anyone who loves the 66 TV show should buy it for this price. Next please get this on sale in europe TLG! I'm torn - I like the design of the cave part of the set and the vehicles, but I think the Wayne Manor section is such a waste - and the minifigs aside from a couple don't do much for me. Please please please offer this discount on the UK Lego website! I've been dithering about this set for ages but the fact it is going now has made my mind up. I really just want the car, chopper, and minifigs. But even after points ($20 value) and extras (12-13 dollar 'value") I still have my doubts. From an investment view, this seems like it will have little resale value. I feel like I'm in bizzaro world, the set looks terrible. They figure drop the price and throw in stuff and people might bite. Like others have said, the vehicles and minifigs would be nice, but not at that price. I really like the look of this set, and the discounted price makes me want to pull the trigger. I actually need this set to continue construction on my Batcave moc (this cave will be a "secret room" concealed in the main cave)... the problem is now coming up with the funds, I barely got away with the Ghostbusters Firehouse last year. Agree that the only thing sparing this being as big a bust as Hoth is the minifigures and Batmobile. But it is still a lot to pay for this these and a pile of brown bricks. I hope Europe follows quickly... Although... With all the sets coming out... It's expencive enough. What a terrible, terrible set. 25 percent won't save this poor set. After seeing what's being done with this set It'll be interesting to see what Lego does with Hoth (any better offer). In Canada Amazon and Walmart have been selling it for 25% off for several months and I guess they still are trying to get rid of their stock. If Assault on Hoth was a 3 / 10 then this is a 4 / 10 set. They must have had a load of Sand Yellow pieces they needed to get rid of for someone to have conceived this set. It isn't even a set. It is minifigures, vehicles and 3 unconnected lumps of brown pieces with a little bit of a building facade. Horrendous. I hope whoever thought this was a good idea no longer works for LEGO. Going to have to take more % off to get me to purchase this over priced atrocity. The batmobile and figures are the only worth a damn in this set. I'll give them $99. I'm OK not owning it for more than $99. Glad to see a few people are calling this set out for the utter tripe that it is. I felt utterly mystified by the excitement surrounding it at launch - it looks like something thrown together by an unskilled six year old. How on earth did this set ever get to market? I'd ask how it got 'beyond the drawing board' - but I can't imagine this thing was ever actually 'designed'! There sure are some suckers out there, but I guess Lego reckon that Minifig fans and adult nostalgic nerds will literally buy anything these days. You kind of need a few of these to finish it off in any direction, so at least the discount helps a little there. It's not a well designed set, but the parts and figures are worth the price to me. Just noticed interesting fact: Have you seen on (EU LEGO shops) that this Batman Cave is even more expensive than the newly released Ninjago City? - which one would you choose.. ? (evil grin) .. there should be some kind of voting system to display the inevitable. Used my VIP points, and got it (and all the freebies) for $10. Pulled the trigger. Planning to keep the Batmobile, Batman, and Robin and sell the rest. Considering keeping Alfred and the Joker.